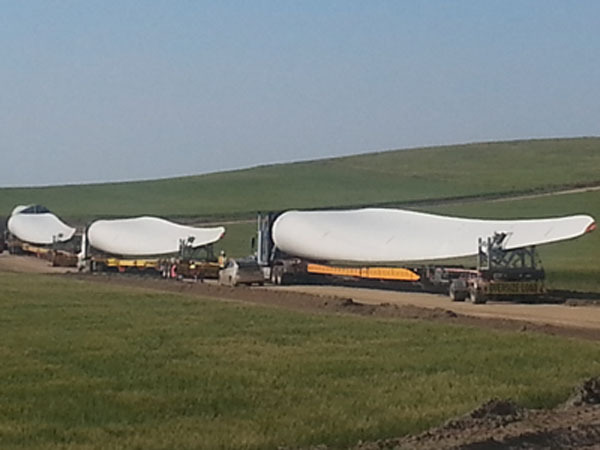 August—Back to the old country! 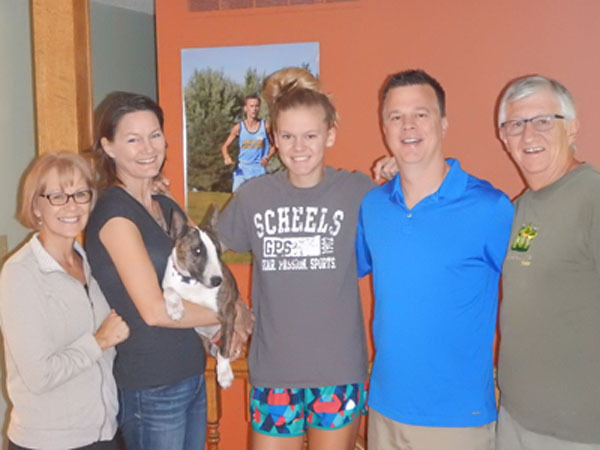 After spending two weeks with Carmen in California and a week on the road, we returned to North Dakota the beginning of August for more time with family and friends. 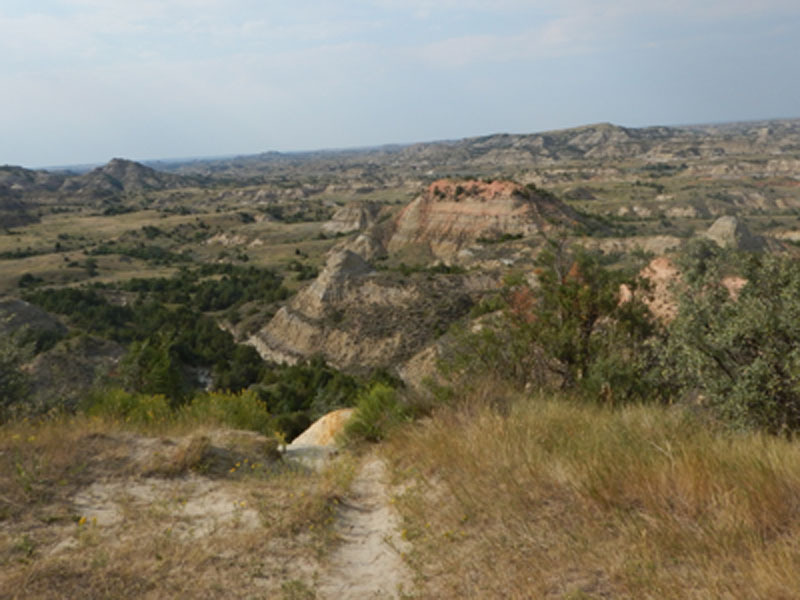 We took this picture of the "painted canyon" while touring the Badlands, near Medora. While we were in California, we helped Carmen car shop for a 2015 GMC Yukon. 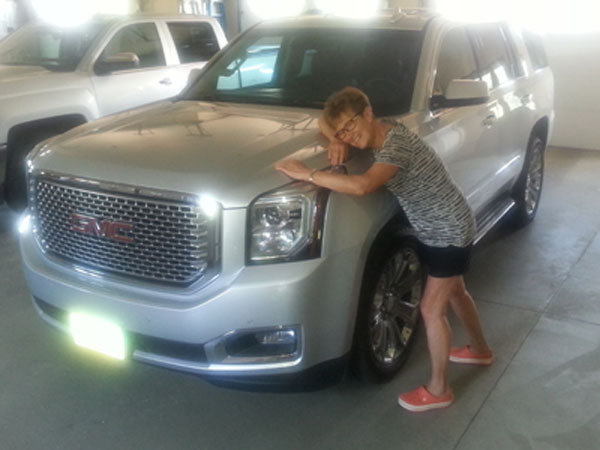 Arriving in ND, Lorraine showed how much she loves her new GMC Denali. 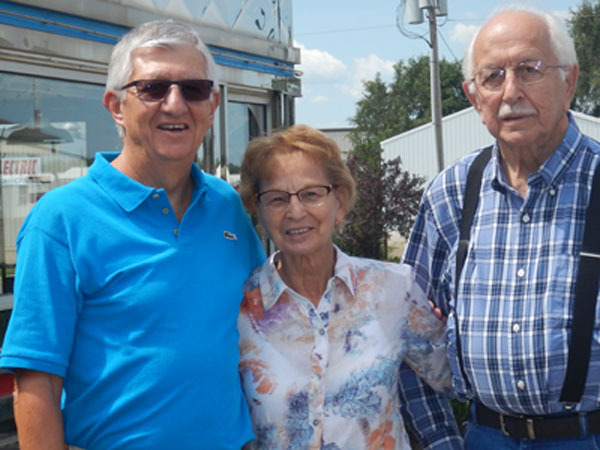 Lorraine and Frank took us on a drive in the country near their farm, which is now a staging area for a new crop of wind turbines. 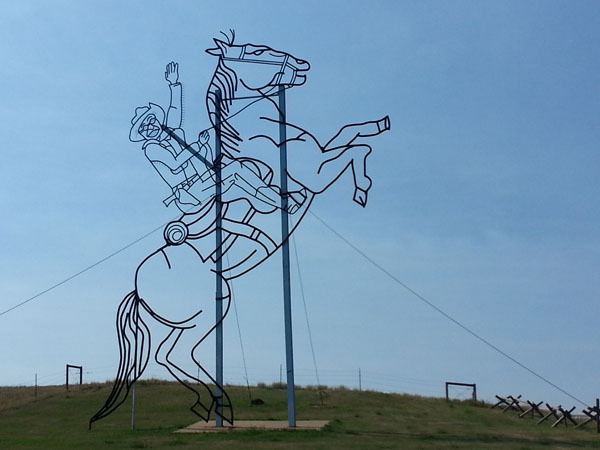 Teddy Roosevelt Rides Again, is one of a dozen large art metal sculptures that lines the Enchanted Highway between Gladstone and Regent. 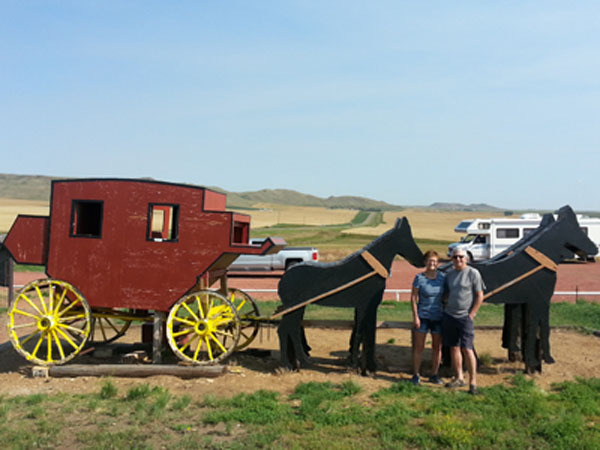 Lorraine and Larry used this stage coach as the backdrop for this picture. We were surprised to see so many cars and RVs from states throughout the USA. 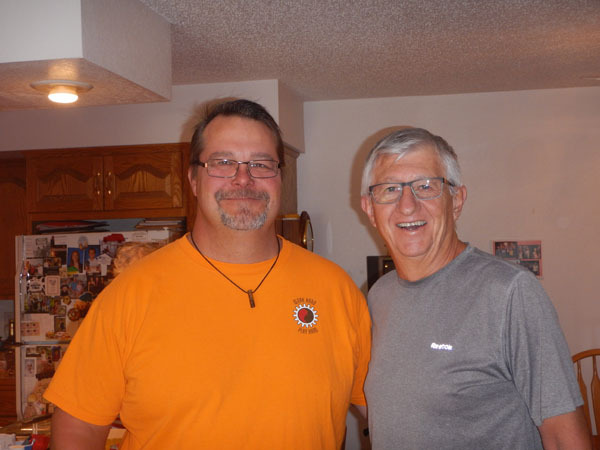 Back in Bismarck, we got caught up with Larry's nephew Randy who is transitioning from an oil driller to a refinery operator. Best wishes!! 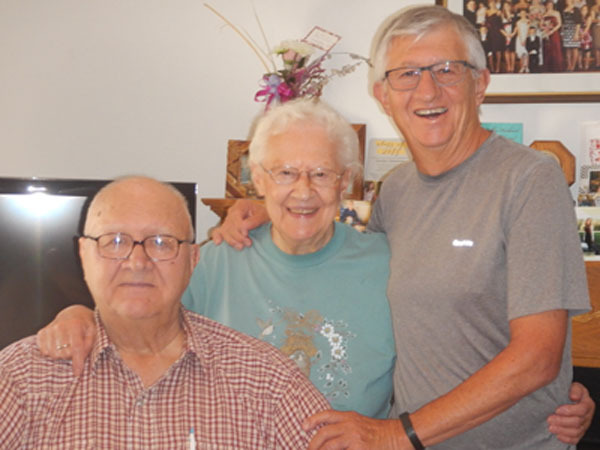 We also got to catch up with Larry's siblings, Lillian (who just turned 88) and Jacob. Stories, food and cards filled the hours we spent together. 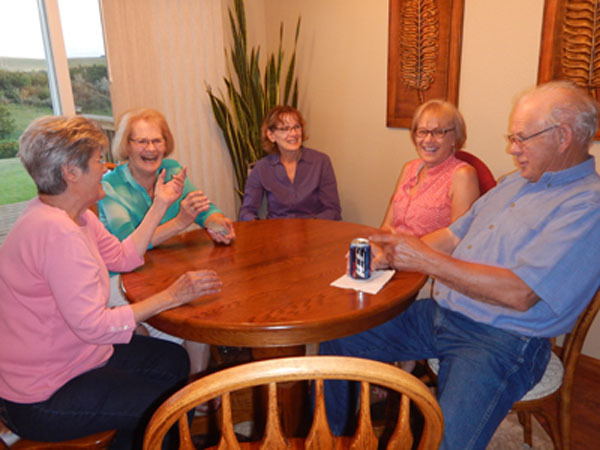 Glorine enjoyed catching up with her siblings, Ray and Ida, Marlene and Maureen (who flew in from Mexico for a special occasion). 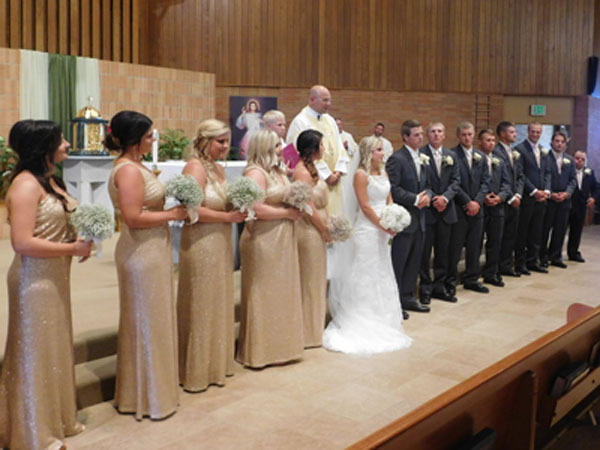 The special occasion was the wedding of their niece's daughter, Jordan, who visited us in Mexico. 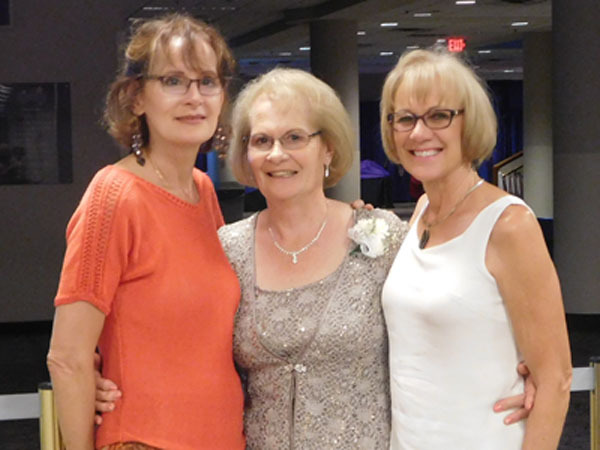 In addition to Mass, they hosted a social, dinner and a dance. 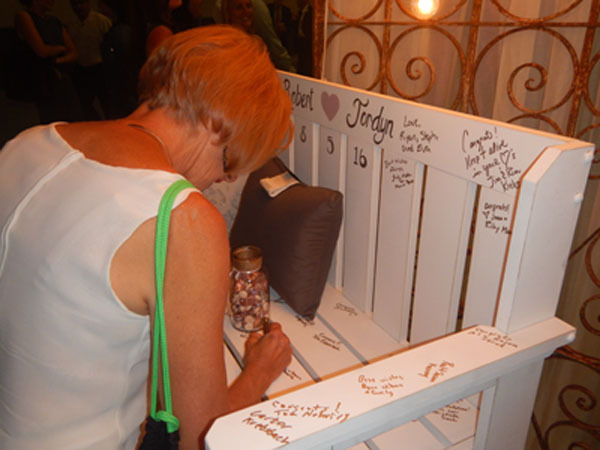 Rather than signing a guest book, guests used this bench to sign in with their warm wishes. Grandma Marlene was a happy camper to have her entire family together along with two sisters. 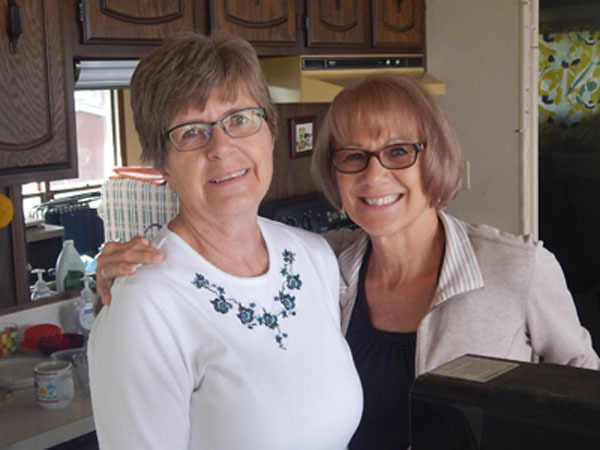 We met up with Larry's sister-in-law, Gloria for breakfast and updates on her kids and grandkids. 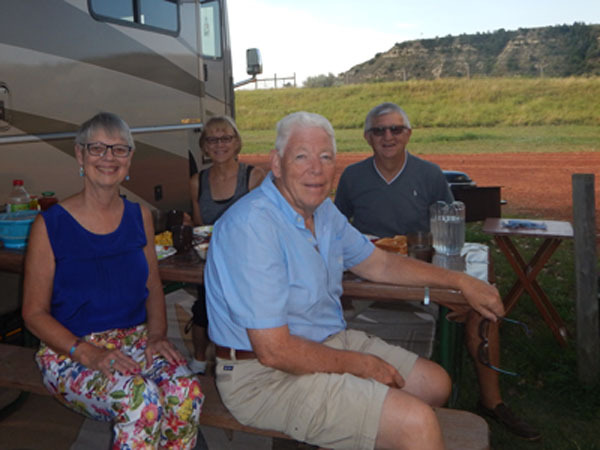 From Bismarck, we drove the RV to Medora to meet up with Brian and Marilyn, friends from Regina. 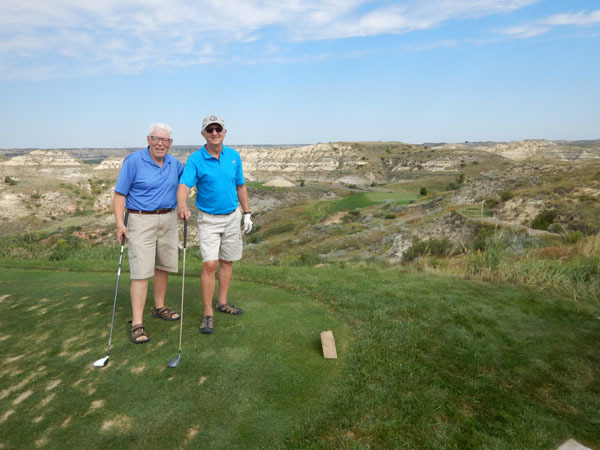 The boys took in a round of golf at Bully Pulpit, recognized as one of the top 100 courses in the USA. That evening we enjoyed a "pitchfork fondue" with steaks and all the trimmings. 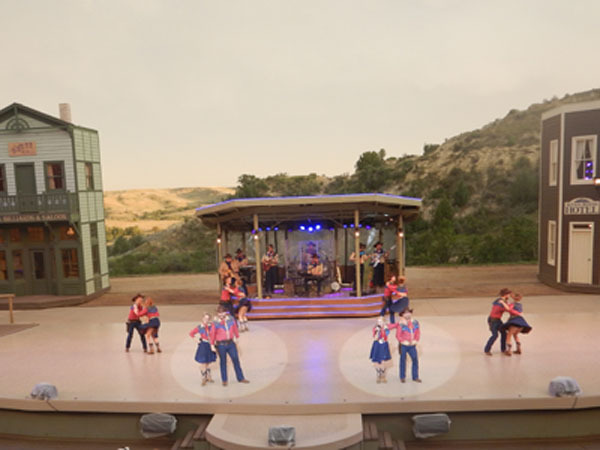 The Medora Musical is said to be the "rootin'-tootinest, boot-scootinest show in all the west". 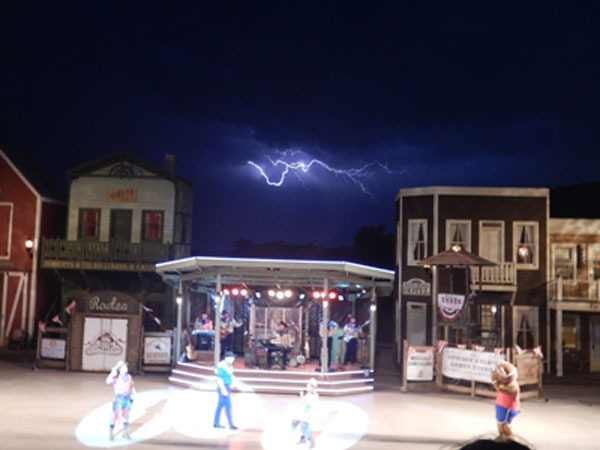 That lightning was not a part of the show. Following intermission the show was cancelled with a full refund. It was a great fun-filled two days, which included catching up, cards and this badland's breakfast out in the open. 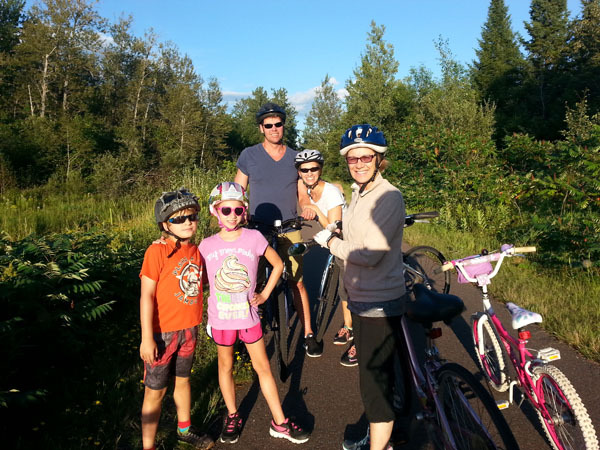 Our next stop was Pathfinder's Village Campground in MN, where these kids kept us busy with biking, golfing, swimming etc. 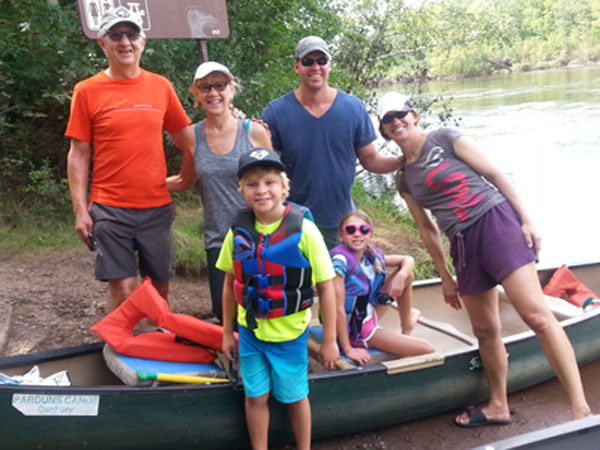 The St. Croix National Scenic River Way was a few miles away, which we enjoyed in these canoes. 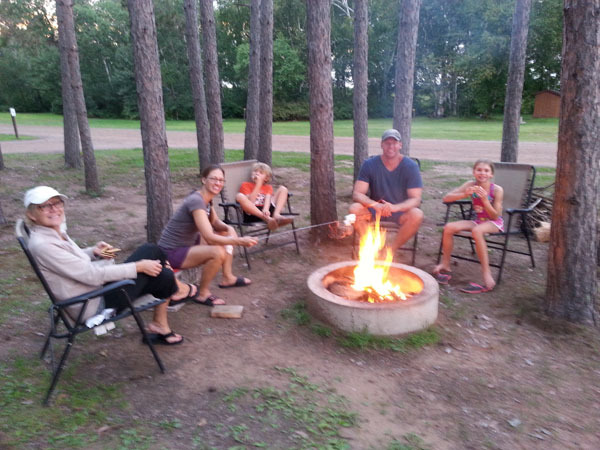 S'mores comes without saying and the kids were not disappointed. 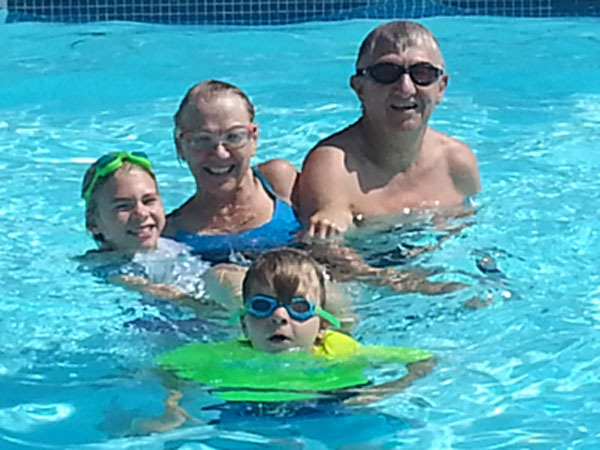 The kids kept us busy in the pool, including hand stands, which we had just completed. 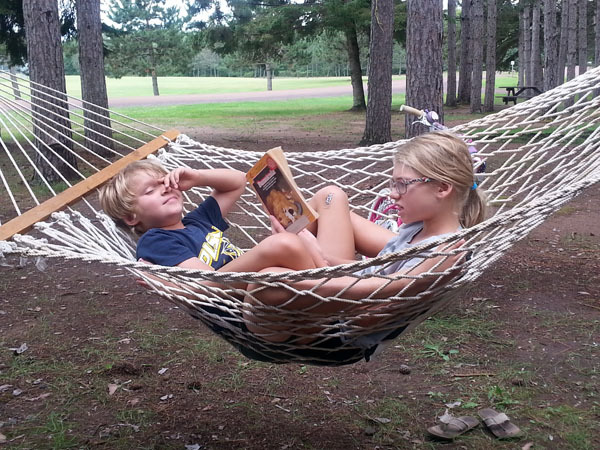 And while we were not playing, the kids entertained themselves on the hammock, with a book. 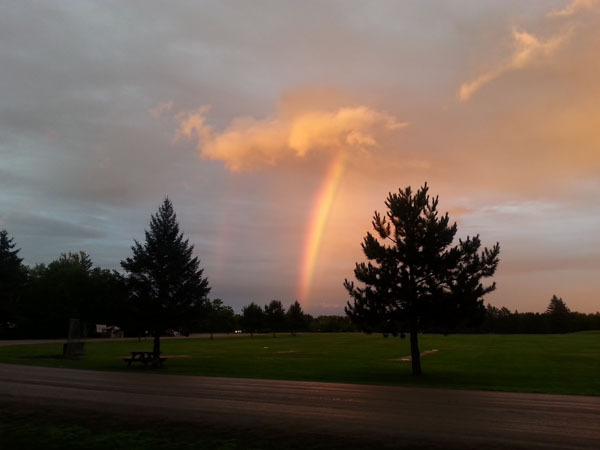 This double rainbow was one of the great things that came along with the many rains we experienced. 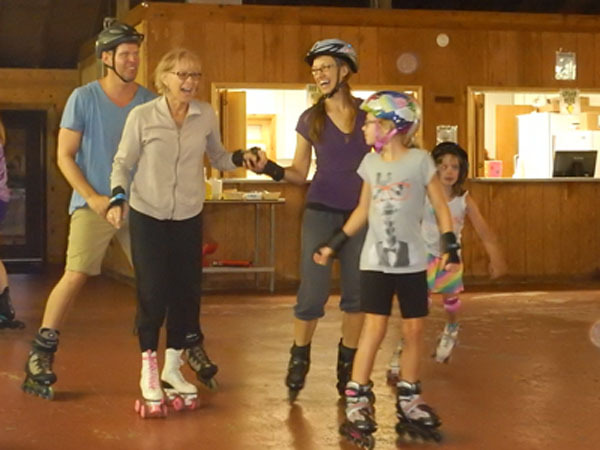 The campground has a clubhouse that offers roller blading/skating on weekends. 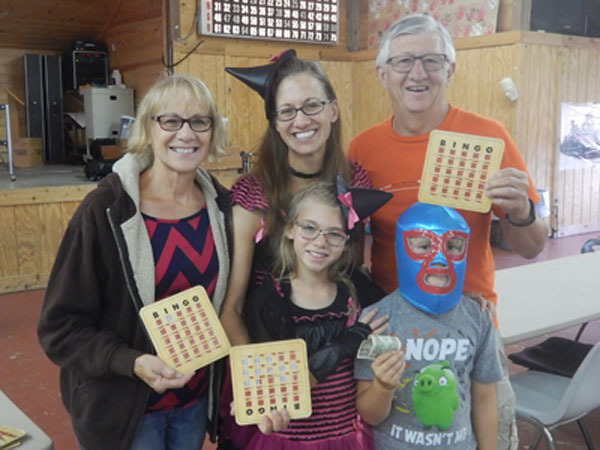 Along with an early Halloween, we all got to take in 25 cent BINGO. Luckily, Chase won the prize for a cross. 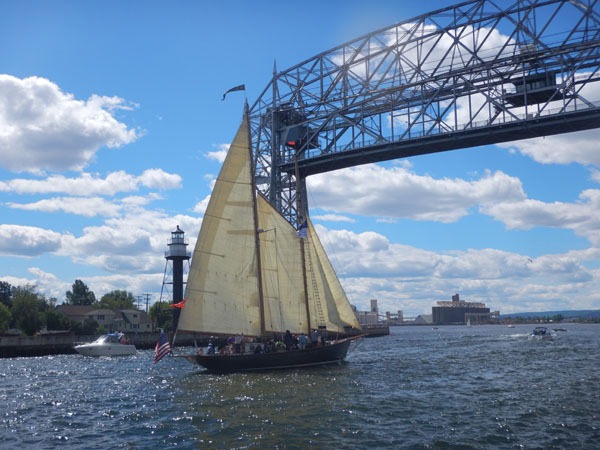 Dozens of Tall Ships graced the Duluth Harbor through the Areal Lift Bridge with a 180' clearance. 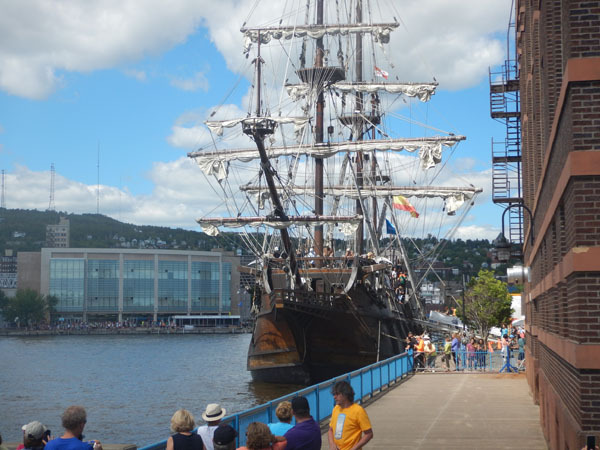 This Spanish galeno, drew thousands of people who waited hours to take a peek. 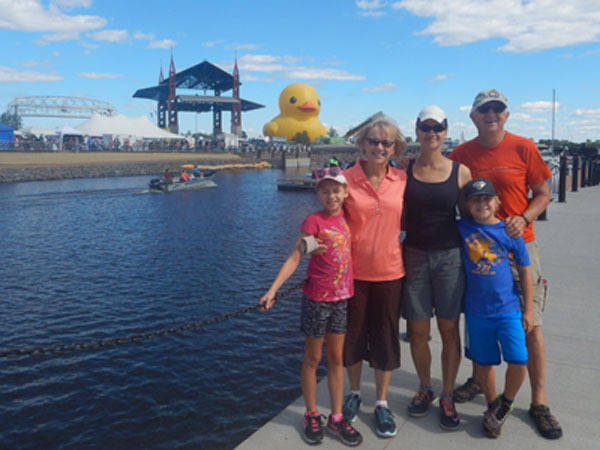 As if the Tall Ships were not enough to draw people, they brought in the "World's Largest Rubber Duck." 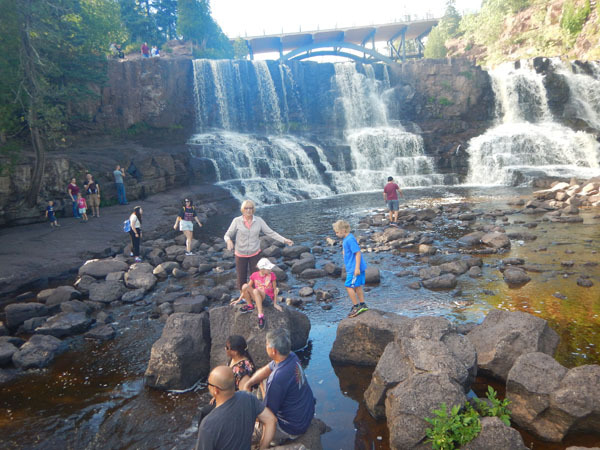 Gooseberry Falls, north of Duluth kept the kids (and Grandma Glorine) navigating rocks. 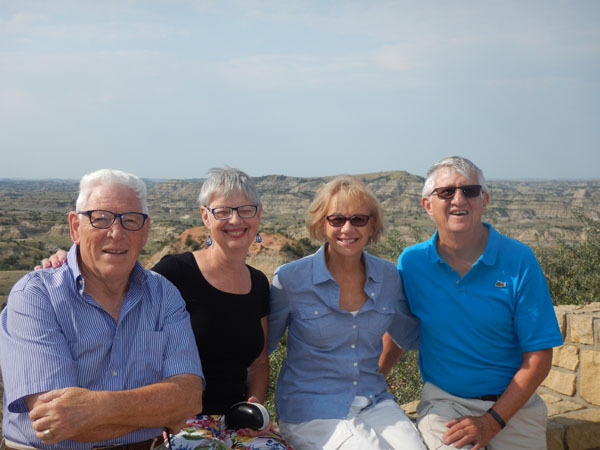 Our next stop was with friends Jane (and Jerry) who met Glorine in graduate school in St. Cloud. 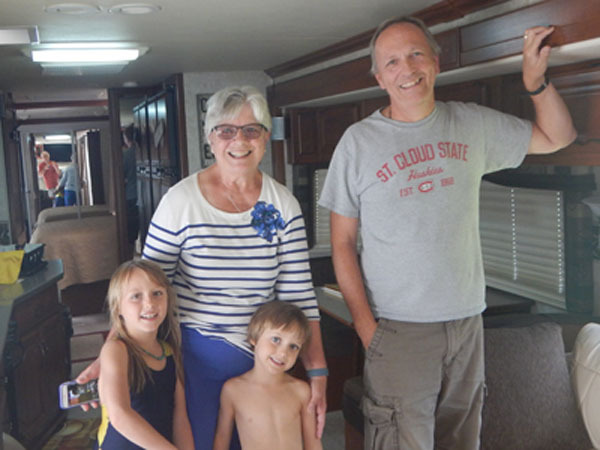 Jane's sister Judy and her husband Luther gave their Japanese grandkids a tour of our RV. They wanted one too! From there, we went to Larry's nephew Brent and Barb's place. 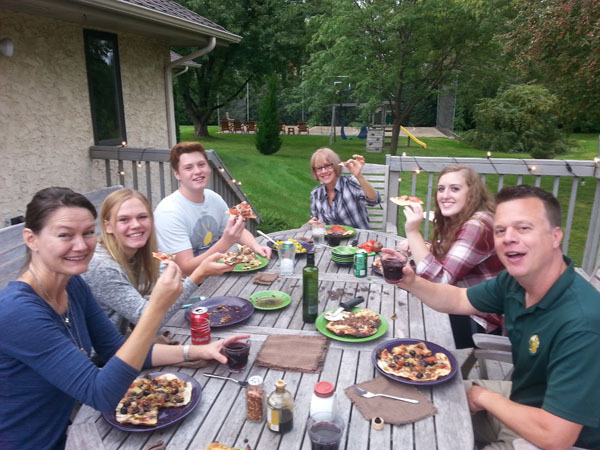 The pizza, which we built ourselves was a hit. Their son, Conner is a runner at North Dakota State. The poster is of him in the background. 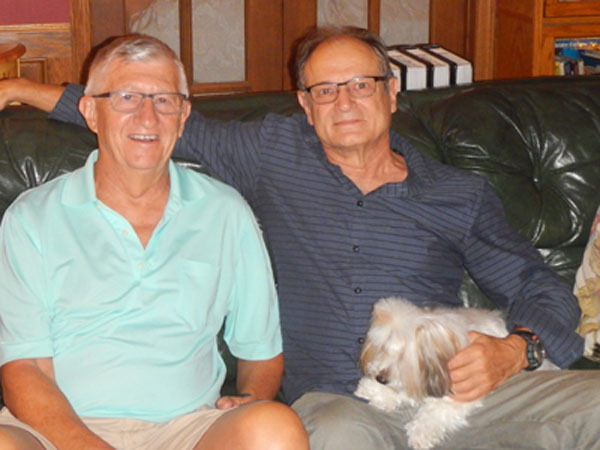 We got to catch up with Ken, a colleague of Larry's from St. Cloud. 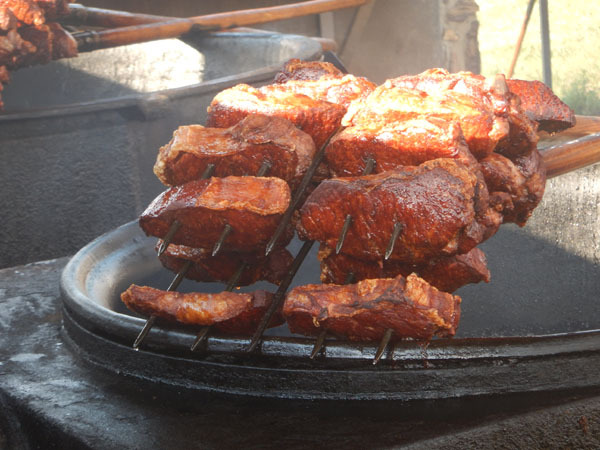 The dinner they cooked was spectacular. Hockey, hockey and more hockey keeps the kids (and Denise) busy. 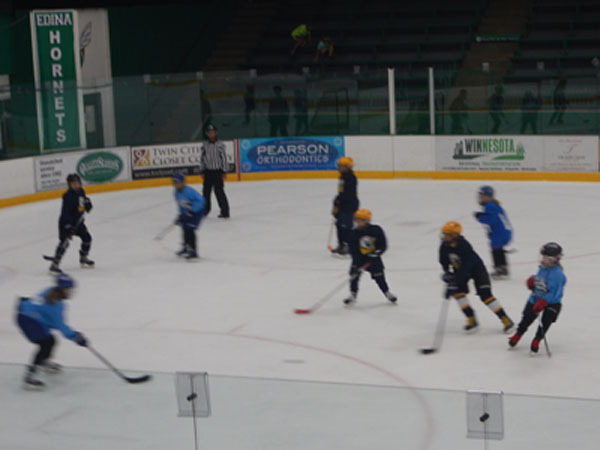 Here Clara is playing center. 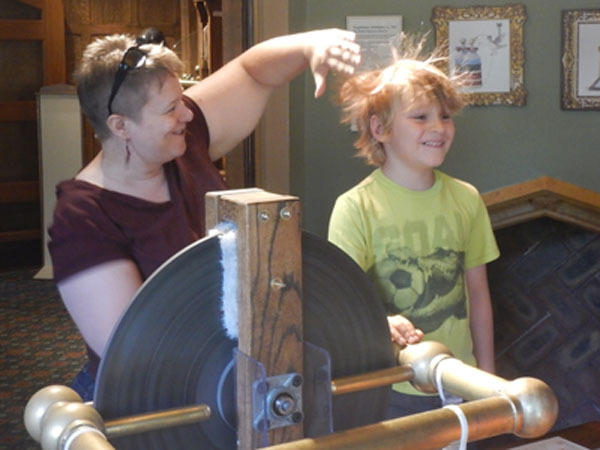 The Bakken Museum was a treat, where Chase got a greater understanding of electricity and magnetism.